Yesterday Hamas unveiled their own tank, supposedly made partially of captured Israeli tank components, during a memorial procession for seven fighters killed in a tunnel collapse in Gaza. Yet upon closer inspection, the tank in question is more movie prop than war wagon. 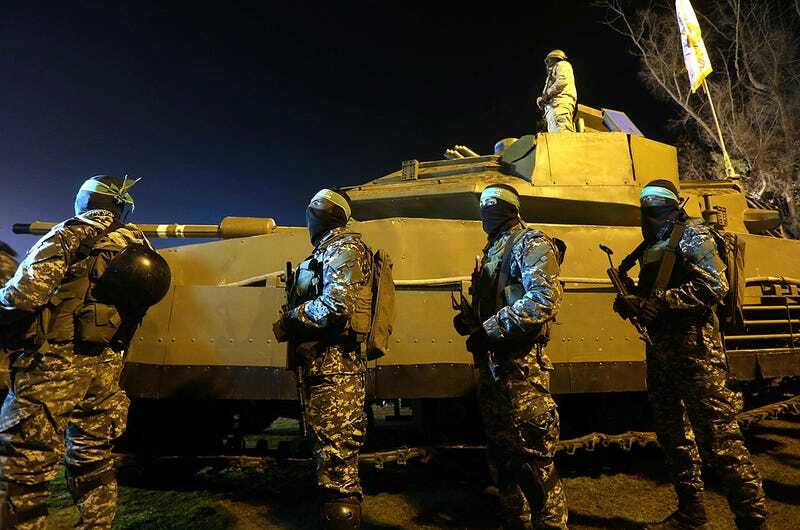 The idea that Hamas could now be fielding tanks, especially while under tight import controls and the watchful eye of the Israeli Defense Forces is puzzling to say the least. Israeli tanks have been the bane of Hamas forces during incursions into the Gaza Strip in the recent past. With this in mind, the idea that Hamas could have something, anything really, that could even approach such a modern tank’s capability would be a very big, in not unbelievable deal. But upon closer examination, it turns out Hamas’s newly unveiled “tank” is at best an armored car, and more likely just a low-end prop. This is especially evidenced by the the fact that the tank’s tracks don’t even touch the ground and it happens to have tires hidden under its hull. And yeah, the rest of it looks pretty lame too. The fact that Hamas thought they could ever have a chance of passing this thing off as real is also eyebrow raising, as you could say it shows a pretty clear separation from reality. Really, Iran has done just as bad in the past. If anything else, Iran and its proxies could start a lucrative international business enterprise designing and building military related parade floats.